Explanation: Score three points for NASA. With time running out late in Apollo 15's mission to the Moon in 1971, Astronaut David Scott prepared to "split the uprights" and bring about yet another dramatic end-of-the-mission win for NASA. 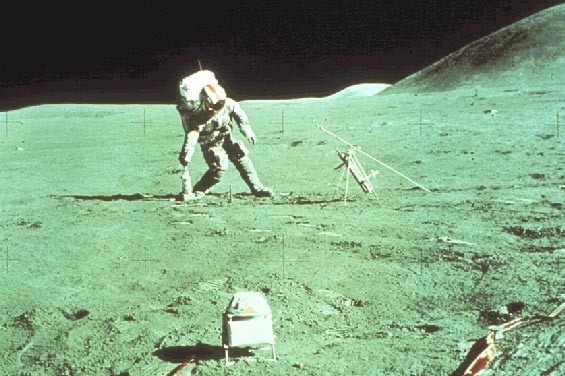 Scott used a special "lunar football" designed for the rugged games held on the Moon. R1D1, a predecessor to R2D2, cheers from the sideline. Happy April Fools Day from the folks at APOD. In reality, Astronaut Scott adjusts one of Apollo 15's lunar experiments. The foreground device actually measured high-energy particles that escape from the Sun.